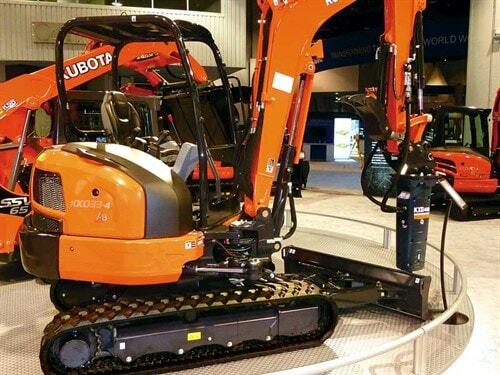 The latest mini excavator offering from the Japanese manufacturer is the KX033-4, which replaces the KX91-3. It gets many of the firm’s large machine features, including dash-controlled presets for auxiliary circuits, allowing the operator to dial flow rates up and down. A hydraulic system delivers a flow rate of 60 litres/min, extending the machine’s functionality with attachments. Power comes from the 24.8hp Kubota direct injection engine, which achieves EU Stage IV emissions regulations without the need for a DOC or DPF. An optional angle blade is available and it includes blade float, plus more blade geight. It also gets a reversible and replaceable cutting edge.